Dr John Hardman trained in London and Cardiff. His main interests are vascular and interventional radiology. He has led the development of a large endovascular aneurysm repair (EVAR) programme in Bath and has the largest personal series of EVARs in the south west of England. 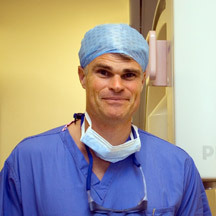 After further specialised training in Australia in 2008 John introduced fenestrated and branched EVAR at Bath, which is now a leading UK centre for complex aortic aneurysm repair with cases referred from the South West of England and South Wales. He supervises and mentors EVARs at multiple centres in the UK and Europe and organises EVAR workshops in Bath for European clinicians 3 times a year. He teaches at the UK interventional radiology courses, UK Embolisation meeting, the European Vascular Course and at the Cardiovascular and Interventional Society of Europe annual meeting. He regularly speaks at, and chairs, scientific sessions at national and international meetings. His research interests include complex aortic aneurysm management and he has published over 30 peer-reviewed papers, reviews and book chapters as a consultant. Use of the Aorfix™ stent graft in patients with tortuous iliac anatomy. Outcome and Safety of Aorfix™ Stent Graft in Highly Angulated Necks – A Prospective Observational Study (Arbiter 2). The advantages of Aorfix for endovascular repair of abdominal aortic aneurysm.